Not long ago, I took a half day trip to a nearby zoo with my visiting nephew. I haven't been to a zoo since I started drawing live subjects in public (thanks to a wonderful class by the magnificent Roz Stendahl). And I felt emboldened by my recent county fair sketchouts, so I thought I'd take along some stuff and sketch. My goal was to move at my nephew's pace, and not to stop and thoroughly get to know an animal before I sketched it. I viewed this as an exploratory outing: what animals live at the zoo? Where are they? What is the viewing like? 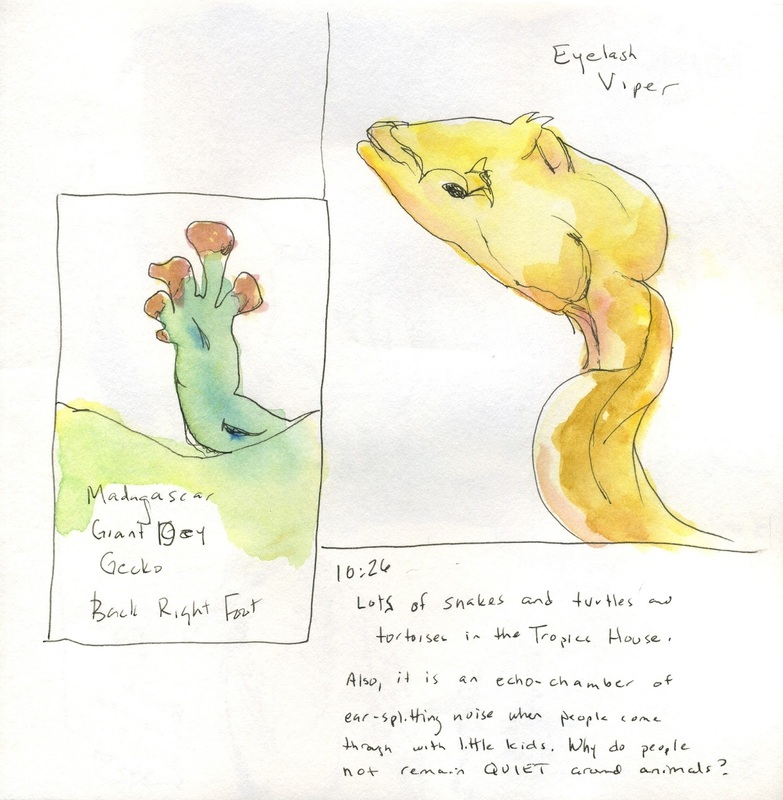 So we moved fast and I sketched and painted fast. I was able to completely twelve 8x8 pages, in a homemade sketchbook using Aquabee Super Deluxe sketch paper, in about three hours. In this first page, I specifically left a space to glue in the ticket when I got home. I noted the date and arrival time. Then I started with the first animals we encountered. The spider monkeys moved very fast, and I quickly realized that I wasn't going to try to get any details or paint down. I just grabbed gestures, noticing the way they used all five limbs to hang and sit and flop. Then one monkey spent a long time examining something at the bottom of a bucket, so I was able to do a bit more detail on that. I also decided at this point to mark each drawing with a time mark. Next we went into a "tropics" building. Sloths!! 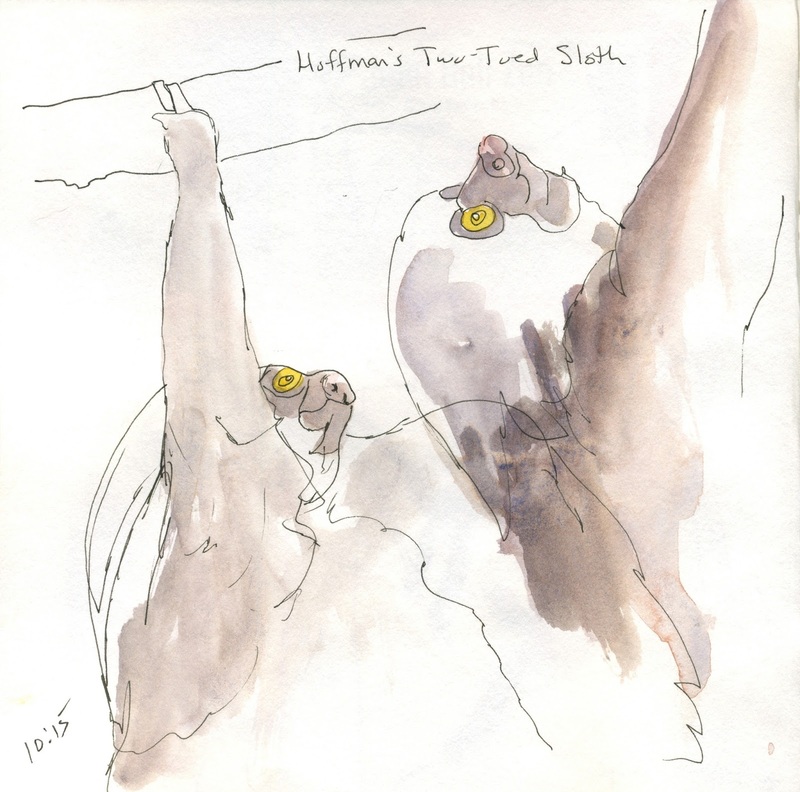 Sloths are very nice zoo animals to draw. It turns out that nothing in the tropics exhibit moves very fast, so I was able to take a bit more time with close-ups and paint application. We had noted the penguin feeding time when we walked into the zoo, so we rushed over there to watch. This proved to be a great sketching opportunity because the birds stood fairly still watching the feeder and the crowds stood fairly still watching the feeding. I realized that, for me at least, penguins are really hard to draw. I think this might be because I have strong image in my head of a penguin, and it is based largely on animation! Anyhow, this was a great exercise in observation. Next we wandered through the big cat section, but none were out. 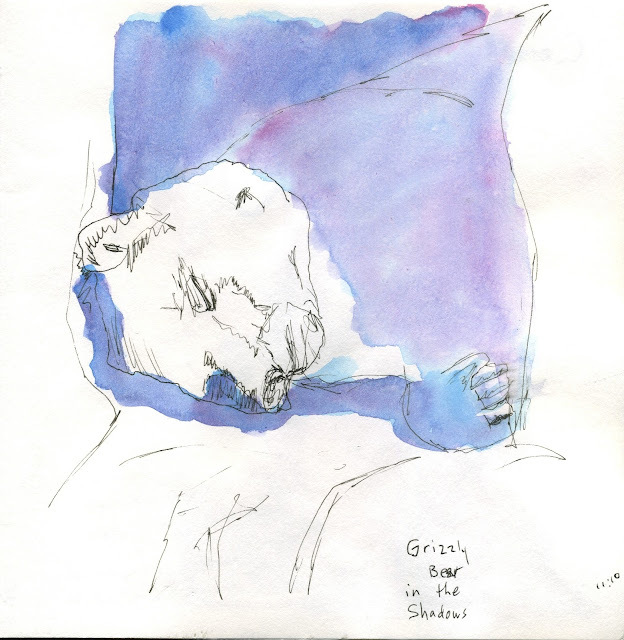 However, we did find a grizzly bear, asleep in the shade except for its head, which was out in the bright warm sun. Because of the angle and distance, I found the mouth area particularly challenging. I feel like what I sketched was quite accurate, but my brain couldn't make sense of what it was seeing. 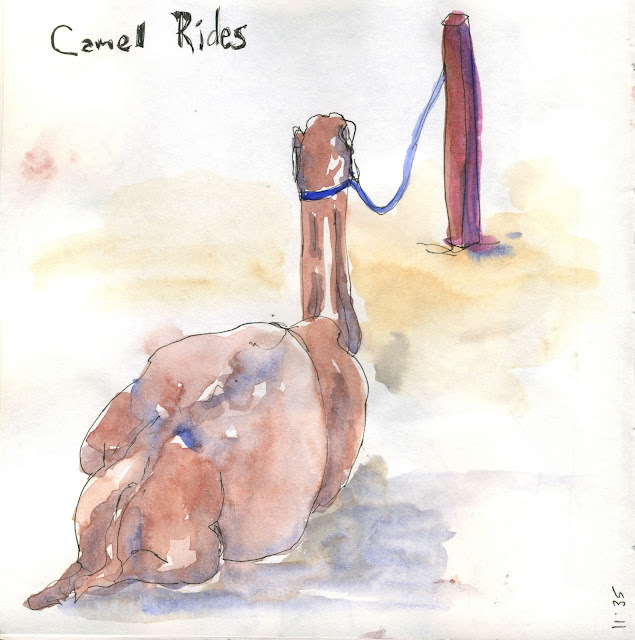 As we meandered toward the tiger exhibit, which is up a bluff higher than the rest of the zoo, I was able to look down on the camels waiting to be saddled for camel rides. I grabbed the opportunity to sketch from this unique angle, and in a few minutes completed what might be my favorite sketch of the day! 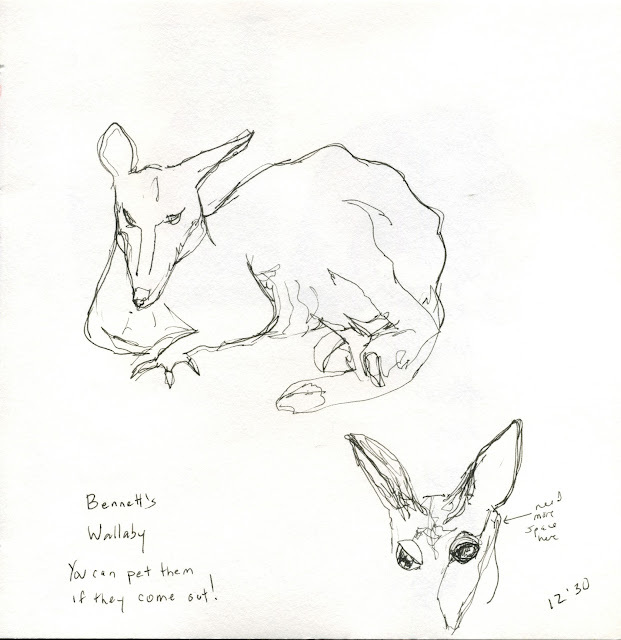 A wallaby exhibit came next and I don't know if I was getting tired or if wallabies just aren't my thing, but I couldn't get a fair likeness. Things settled out when we got to the lemurs, however. This minimal sketch really appeals to me because I feel like I got the body weight distribution, and the head and tail just right. You can see from my lines it took me a few tries! 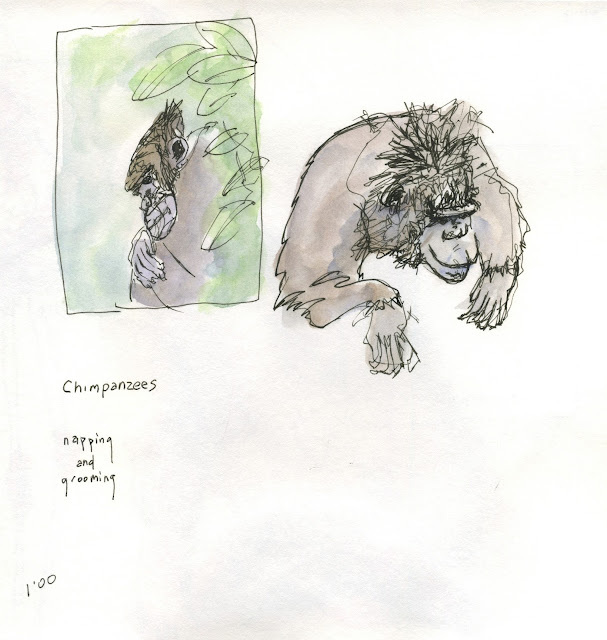 Perhaps the greatest challenge of the day for me--drawing-wise--came with the chimpanzees. I am not sure why. Maybe because they are the closest to humans, but so very different. I caught myself just using the pen to explore shapes and angles, which is why these look so very scribbly. I was getting to know the subject with the pen. At our last stop on the way out we passed an area of flamingos and tapirs. 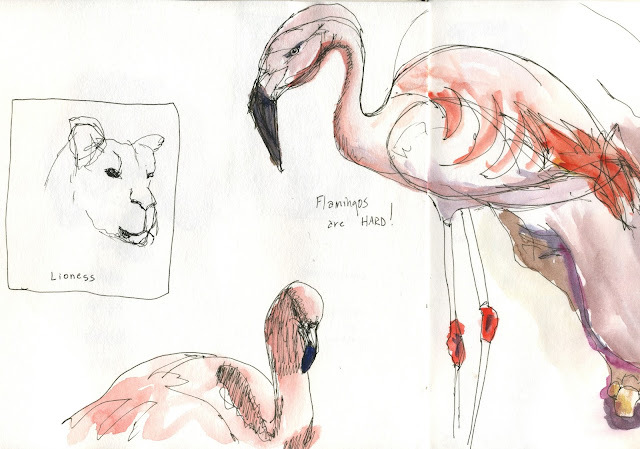 Flamingos, like penguins, proved super hard for me, I think because my brain believed it knew what a flamingo looked like, and kept trying to draw what it knew instead of the animal in front of me. It proved a really interesting exercise in letting go of pre-conceived notions and dealing with reality! 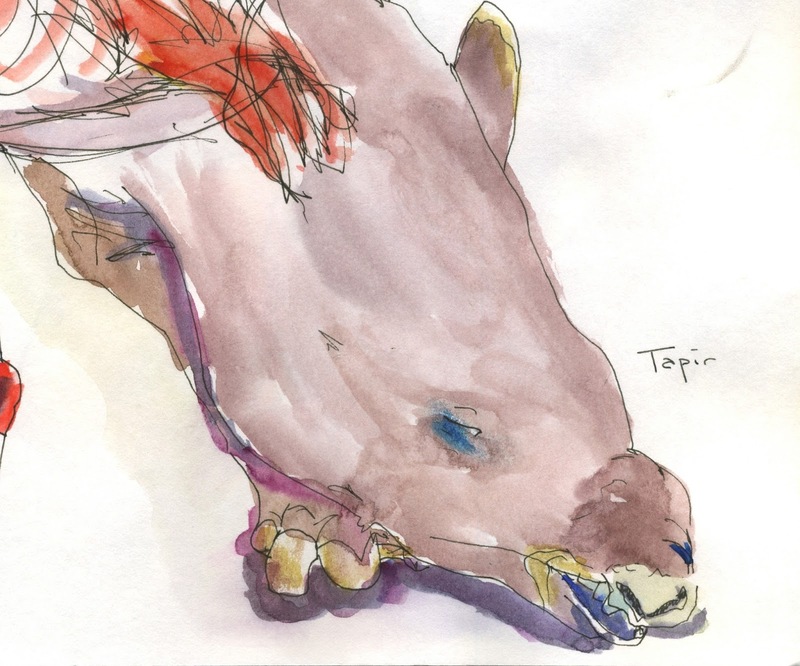 Unlike the flamingos, the tapir was easy to draw, maybe because I'd never really looked at one before! So I was not fighting my brain's idea of what a tapir should look like. This one delighted me because it was snoring away during a deep nap, with its nose mushed against the ground, and so twisted at an angle to the rest of its face. Its teeth showed. Its lips burbled as it snored. Really fun to draw. By this time, we had to leave. 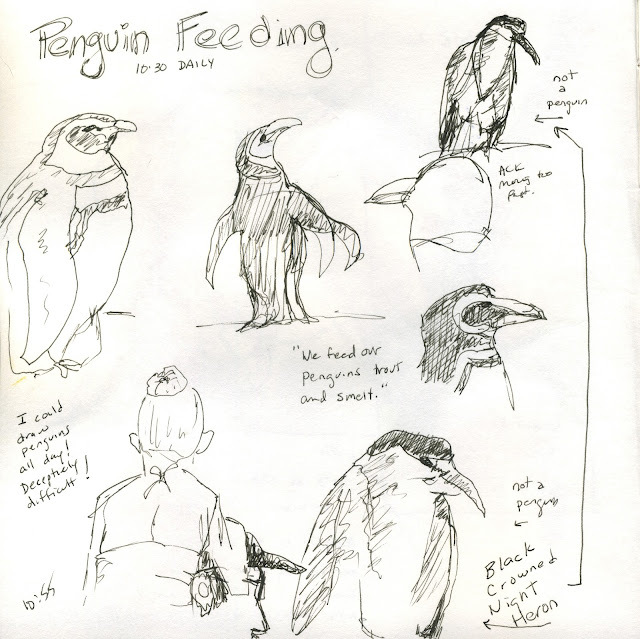 I had a wonderful and tiring time scribbling at the zoo. If I were to go back, I would plan to go alone and do it differently, perhaps picking only a few animals to watch and draw over and over. I have to confess, the zoo sketching experience was not nearly as fun for me as scribbling at the county fairs. The animals at the fairs seemed relaxed and interested and interactive. The zoo animals seemed bored and maybe unhappy. 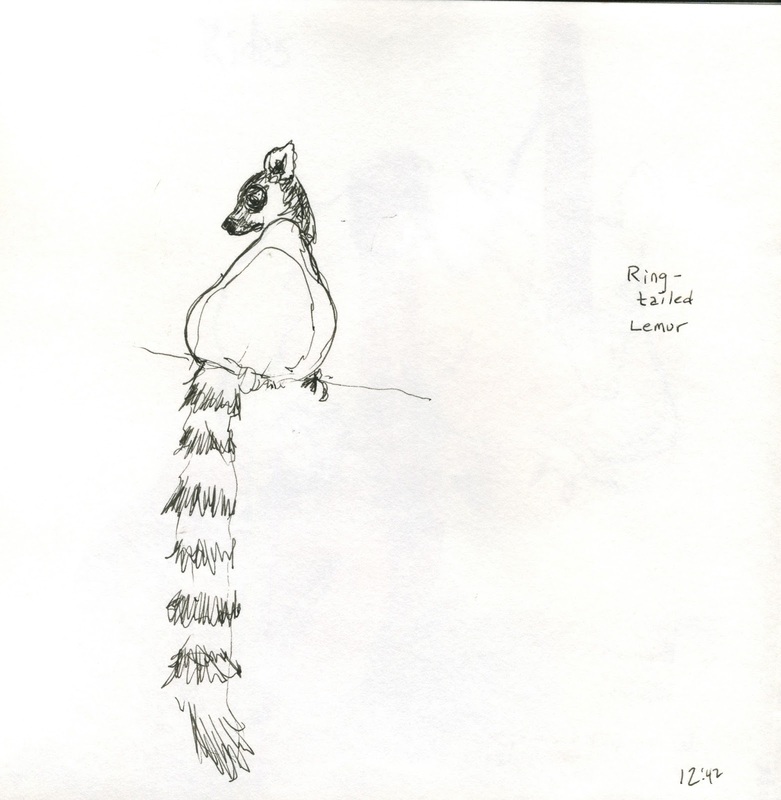 I could get much closer to the animals at the county fairs, and really observe details, while at the zoo I had to draw many animals from quite a distance. Finally, the overall visiting experience at the fair matched my mood more. In the animal barns at the fairs, people respected the animals, moved with purpose, watched out for other people. Adults spoke quietly to their kids for the most part, pointing out things about the animals. They also kept their children contained, not allowing them to run and scream at the animals and bang on cages and so on, which I saw constantly at the zoo. It horrified me to see so little respect for the animals in the people there. Not the workers! The visitors. 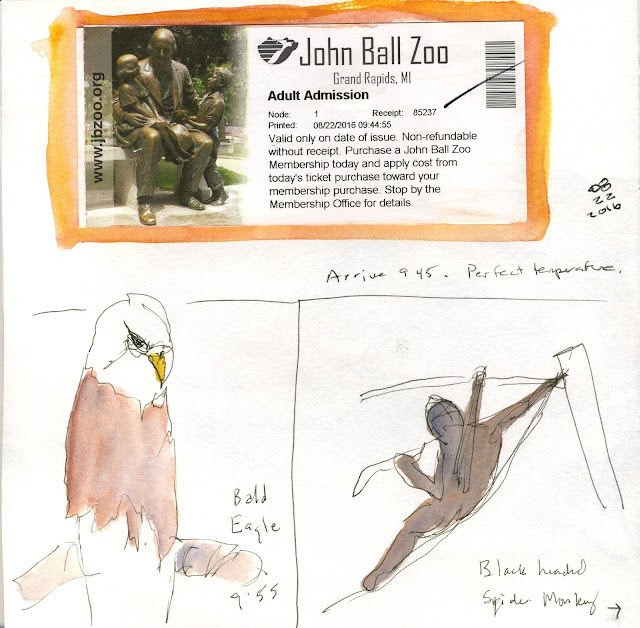 I'd love to see a sort of "adult swim" instituted at the zoo, when adults only can go--no one under 18 admitted. I wonder if that would be better? Have others had similar experiences at other zoos?